Pandan is a kind of plant that grows in tropical areas of Asia and has a big name for years. Be it used in making desserts or savory dishes, it’ll bring your dish up a notch. I particularly love the sweet aroma of the pandan leaves. The pandan juice squeezed from the leaves is an excellent natural fragrance. 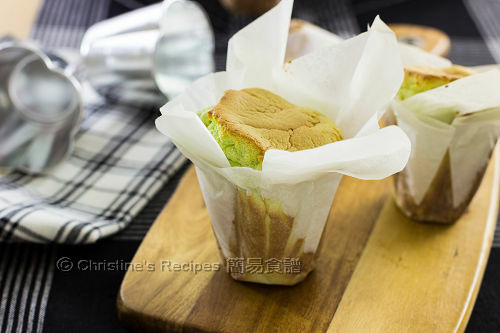 The other day, I made these pandan cup cakes for tea. They were so soft and fluffy as the classic Hong Kong paper wrapped cakes (original flavour), yet with a unique pandan aroma, best of all, with lower calories. Combine cake flour, milk powder and salt well. Place the egg yolks in another large mixing bowl. Add the oil in a steady stream and whisk thoroughly. Add the pandan juice. Sift in the cake flour mixture in three batches. Combine well into a smooth batter. Spoon out one-third of the beaten egg whites and fold into the batter. Lightly fold in the rest of the beaten egg whites, until just combined. (Note: please see this video “How To Fold-in Egg Whites”.) Transfer into the lined cup moulds (Notes: See the video “How To Line a Cup Cake Mould”.) Baked in the preheated oven for about 25 to 30 minutes. A needle comes out clean when inseted in the middle. Remove from the oven and let them cool completely. Enjoy ! Cut pandan leaves into chunks. Place in a food processor and add water to process into small pieces. Place pandan leaves in muslin cloth/cheesecloth or use your clean hands to squeeze out the juice. Measure out the quantity yielded by this recipe. If your food process is too big or the pandan leaves can’t be processed properly, you can add more water then. Let it set aside for about 30 minutes. You’ll see the liquid separated into two layers. Discard the water at the top. Measure out the concentrated pandan juice at the bottom. Pandan leaves are available at Asian grocers that might come in fresh or frozen. The leftover cakes can be stored in an air-tight container and chill in fridge up to 3 or more days. Simply reheat it in a low-temperature oven for about 10 minutes. It’ll taste like fresh from oven. You can use any cooking oil that comes in handy. Yet don’t choose any oil with a strong or overpowering smell. 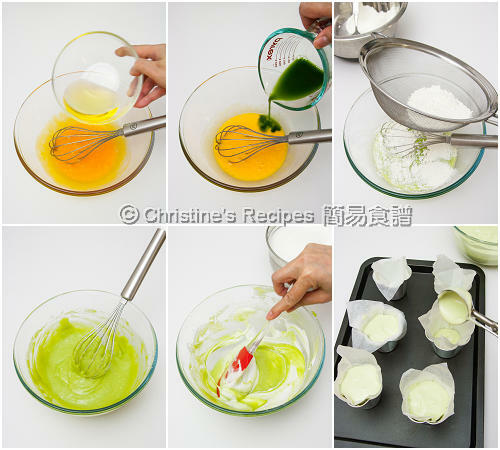 The special cup cake moulds I used were bought from a bakery shop in Hong Kong. You can use a muffin tray or ramekins instead. Hi Christine, thanks for sharing all your recipes and tips so generously. Really helpful to me who is currently trying to bake more cupcakes. So beautiful! I wish I could get some pandan leaves over here. Love their natural green. hi Christine, if I use muffin tins, how many cupcake size little cakes will I get? Depends on how big your cupcake tin is. Can't tell how many exactly, sorry. Hi Christine, this recipe is great! Can we substitue milk powder to other items? The milk powder is to increase flavour. You might skip it if you don't have any. Hi Christine, if I use Pandan extract will that work? If yes, do you know how much I should use? Would 1-2 tsp be sufficient? Thanks! Your pictures always look so yummy! 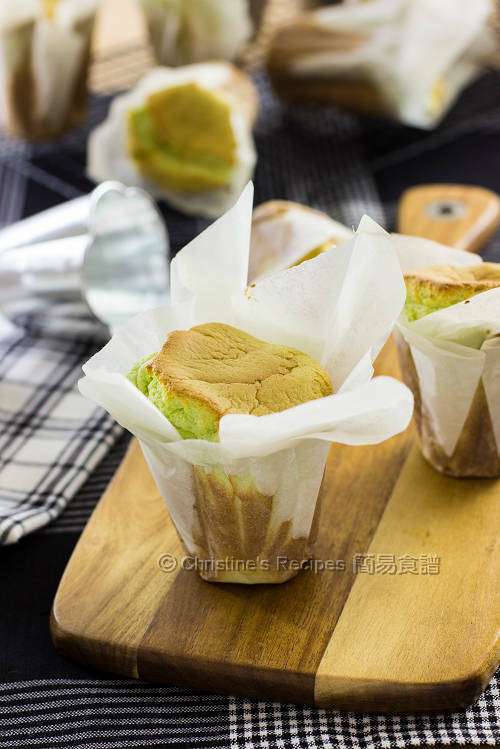 You can use pandan extract. Only a few drops will be enough. You'll get the green colour and fragrance. Remember to replace the pandan juice yielded in the recipe with water. Panda Paper that's interesting, I like this one and tried a lot, I think is not easy to make. I think you can. Feel free to experiment. hi, do you invert the cakes to prevent it from sinking ? I removed the cakes from the moulds, couldn't invert them, simply put their sides on the wire rack to cool down. Hi Christine, do you invert the cake to prevent from sinking ??? Couldn't invert them. Simply put their sides on the wire rack to cool down. What paper are you using for lay in the cup?Where to buy? I used baking paper and trim down to fit the cake moulds. You can easily get baking paper (or parchment paper) from any supermarkets. I use a cake tin and it collapse badly. Does it mean this recipe cannot use cake tin? It'd be a challenge if you use a large cake tin. Did I miss out the milk powder and salt under the method? I accidentally missed those two ingredients out. Oh my sleepy eyes. Milk powder and salt are to enhance the flavour. You can omit them if you like though. what kind of milk powder do you use? I cant seem to find it in supermarket. thanks. I used full cream milk powder, no sugar in it. It helps increase the fragrance of the cakes. Hmmm... supermarkets should have stock. Interesting. Hi Christine, how much batter shd we fill the moulds? I will be using muffin trays. Thanks for advising! Fill about 70 - 80 % full of your moulds. The cake will expand after heating. Fill up to about 3/4 of the moulds as the cake will rise. Hi I've anlene and S26 milk can I use?? The milk is to increase the fragrance. You can use any kind of milk that comes handy to you. 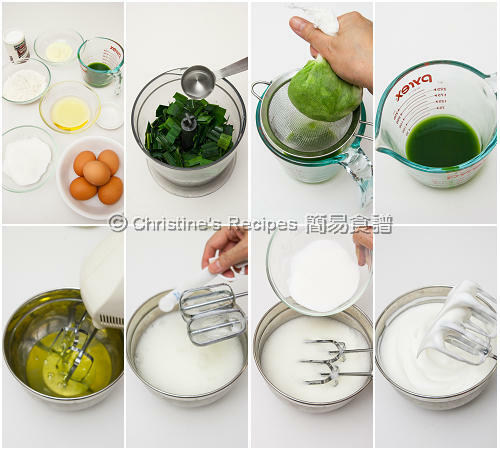 Hi Christine, the cake flour is it self raising flour. Cake flour is a kind of low protein flour. Self raising flour is regular plain flour with an added raising agent. Hi Christine, just wondering where I can buy cake flour from? I live in Sydney. Is it possible to substitute it with any other type of flours? Thanks in advance. Do you have any Asian grocers nearby? They should have some stock. Cream of tartar can help stabilize the beaten egg whites. You can skip it if you don't have any, or replace with 2 teaspoons of lemon juice. Can 1 yo baby consume this ? Normally, a one-year-old kid can start trying adult food if s/he doesn't have any food allergy. You can give him a bit to test try. Can I bake this in silicone cupcake without lining with baking paper as I don't have them. Thanks for yr advice. Sure, you can silicone cupcake. Hi Christine can we put frosting & ganache on the cakes? I think it'll work although I haven't tried. Feel free to experiment. Hi Christine, i have tried it but when i remove it from muffin tray the cake start sinking. Oh sorry for your attempt. This cake is very light, so it tends to shrink once it cools down. Moreover, muffin tray is often non-stick. The cake doesn't have anything to cling to.